Lawyers for Jussie Smollett say the Chicago Police Department put on an “organized law enforcement spectacle” when its superintendent detailed investigators’ findings about the alleged attack on the “Empire” actor. In a statement Thursday night, Smollett’s legal team said Superintendent Eddie Johnson’s comments had no place in the American legal system. At a news conference earlier in the day, Johnson said Smollett owes the city an apology and should admit what he did. Smollett is accused of paying two men to help stage the Jan. 29 attack. Smollett’s lawyers say the presumption of innocence was trampled upon at the expense of Smollett. The statement called Smollett a man of “impeccable character and integrity” who fiercely and solemnly maintains his innocence. Actor Jussie Smollett is earning more than $100,000 per episode of the Fox series “Empire,” a person familiar with the situation tells The Associated Press. Smollett is charged with felony disorderly conduct after authorities say he hired two men to help stage a bigoted attack against him in Chicago in part because he was unhappy with his salary. “Empire” is currently shooting season five, which will feature 18 episodes — meaning Smollett would earn at least $1.8 million for the season. As is customary with a successful TV series, regular “Empire” cast members received a pay increase as part of contract extensions that followed the drama’s second season renewal, the person said. The person spoke on condition of anonymity because salary details were involved. Associated Press Television Writer Lynn Elber. “Empire” actor Jussie Smollett has been released from jail after posting bond. Smollett walked out of the Cook County jail in Chicago on Thursday about two hours after a hearing in which the judge set his bond at $100,000. The actor walked out in a group of people and to a waiting SUV. He didn’t speak to the large media contingent waiting outside. Smollett is charged with felony disorderly conduct. Police allege that Smollett hired two brothers to help stage the attack, which he described to police as racist and homophobic in nature. Smollett is gay and black. Smollett’s lawyers said at the hearing that the actor denies the allegations against him. Tyler Perry, Andy Cohen and former Arkansas Gov. Mike Huckabee are among the well-known figures weighing in on the criminal charges against “Empire” actor Jussie Smollett. President Donald Trump, meanwhile, focused on his slogan, MAGA, and tweeted that Smollett insulted tens of millions of people when he allegedly faked his attack. Jussie Smollett’s attorneys and family members left his Chicago bond hearing without speaking to reporters. One of the attorneys, Jack Prior, told the judge during Thursday’s hearing that Smollett maintains “these are outrageous allegations” and denies they are true. But he and the rest of the defense team left afterward without commenting. About a dozen family members and supporters of Smollett attended the hearing. They stood up throughout the proceedings and also left without addressing the large media contingent outside. Authorities say Smollett hired two men to help him stage a bigoted attack against him on Jan. 29 in downtown Chicago. He is charged with felony disorderly conduct. Prosecutors say “Empire” actor Jussie Smollett misled police and the public to believe that that his attackers were white. Smollett, who is black and gay, is charged with staging a racist and homophobic attack against himself to drum up publicity and because he was upset with his salary. Prosecutors said Thursday at Smollett’s bond hearing that the 36-year-old actor told police his primary attacker was wearing a ski mask that only exposed the area around his eyes, but that he could see the man had white skin. Police say Smollett actually hired two black men to help him carry out the hoax. Cook County Judge John Fitzgerald Lyke Jr. on Thursday characterized what Smollett is accused of as a “violent, despicable act.” Lyke, who like Smollett is black, was particularly upset with the alleged use of a noose during the incident. Lyke set Smollett’s bond at $100,000. Smollett’s attorneys told the judge that the actor denies the allegations, calling them “outrageous.” They said the accusations are inconsistent with Smollett’s character. Smollett, who is gay, told police that two masked men beat him, hurled racist and homophobic slurs at him, doused him with a chemical substance and draped a noose around his neck before fleeing early on Jan. 29 in downtown Chicago. Emanuel issued a statement Thursday after Chicago police detailed their case against the black and gay actor, who is accused of staging a bigoted attack against him last month. Police say he did it to “promote his career” and because he was unhappy with his salary. Prosecutors say “Empire” actor Jussie Smollett gave detailed instructions to two brothers who helped him in a staged attack against him in downtown Chicago, including giving them specific slurs to yell and telling them to shout “MAGA country” and to drape a rope around his neck. Smollett is charged with felony disorderly conduct. A judge set his bond at $100,000 on Thursday. Police allege that Smollett hired the two brothers to help stage the attack, which he described to police as racist and homophobic in nature. Smollett is gay and black. A judge has set a $100,000 bond for “Empire” actor Jussie Smollett, who is accused of staging an attack against himself in downtown Chicago last month. The 36-year-old actor said little other than giving his name at the beginning of Thursday’s hearing. Smollett’s attorney asked Cook County Judge John Fitzgerald Lyke Jr. to release Smollett on his own recognizance. However, the judge said that would be inappropriate. Police allege that Smollett hired two brothers to help stage an attack on him late last month in downtown Chicago. He told police that two masked men beat him and hurled racist and homophobic slurs during the attack. The cable network issued a statement Thursday saying it is shelving the episode of the battle-rap show that pitted Smollett against “Orange is the New Black” actress Danielle Brooks and “American Idol” star Clay Aiken against “Sharknado” star Ian Ziering. It will instead air an episode that pitted actress Raven Simon against comedian Ron Funches and boy band singers Joey McIntyre and Joey Fatone against one another. Smollett is due to appear at a bond hearing Thursday afternoon. An LGBTQ rights group is calling on anyone who feels let down by the allegations against “Empire” actor Jussie Smollett to channel their anger and disappointment into productive activism to fight hate crimes. The group says stopping such violence will require concrete action by lawmakers. Smollett surrendered Thursday on felony disorderly conduct charges. Police say the black and gay actor hired two brothers to help him stage a Jan. 29 attack in downtown Chicago in which he said two masked men beat him while hurling racial slurs at him and looped a rope around his neck before fleeing. A spokeswoman for Jussie Smollett’s attorneys says they may speak to reporters about the criminal case against the “Empire” actor after a bond hearing later Thursday. Anne Kavanagh said defense lawyers Todd Pugh and Victor Henderson didn’t have any immediate reaction to the Thursday morning news conference in which police laid out the case against Smollett. Police say the 36-year-old actor hired two brothers to help him stage a Jan. 29 attack against himself. Smollett, who is black and gay, reported that two masked men attacked him as he was walking home early that morning and made racist and homophobic comments while they beat him. Smollett surrendered Thursday on a charge of felony disorderly conduct. His bond hearing is set for Thursday afternoon. The head of the Chicago police force says that as a black man who has spent his entire life in the city and knows its racial divides, he doesn’t understand how anyone, especially a black man, could use the symbolism of a noose to make false accusations. Police Superintendent Eddie Johnson said Thursday while outlining the case against “Empire” actor Jussie Smollett that bogus police reports harm “every legitimate victim who’s in need of support” and every resident of the city. Smollett surrendered Thursday on a charge of felony disorderly conduct. Police say the actor, who is black and gay, hired the two brothers who are also black to stage what the actor reported was a racist and homophobic attack against him early on Jan. 29 in downtown Chicago. Police say the actor, who is black and gay, hired the two brothers, who are also black, to stage what the actor reported was a racist and homophobic attack against him early on Jan. 29 in downtown Chicago. Johnson alleges that the reported attack was a “publicity stunt” that Smollett concocted because he was unhappy about his salary. Police said the brothers aren’t considered suspects, but they didn’t elaborate. Chicago’s police superintendent, Eddie Johnson, says investigators have phone records that show there were extensive communications between Smollett and two brothers before and after he says they helped the actor stage an attack against himself last month. Johnson said at a news conference Thursday that the records show calls even while the brothers were in Nigeria after the staged attack early on Jan. 29. Police say the brothers left on a trip to Nigeria right after the attack and were detained at the airport upon their return to Chicago on Feb. 13. Johnson says the phone records “clearly indicate” that Smollett and the brothers talked to each other before and after the incident, including while the two were abroad. Police said the brothers are not considered suspects, but they didn’t elaborate. Chicago police said Thursday that Smollett staged a racist and homophobic attack against him last month because he was unhappy with his salary and wanted publicity. Smollett, who is black and gay, plays a gay character on the hit Fox television show. He reported Jan. 29 that he was attacked while walking home from a sandwich shop. Smollett claimed masked men beat him, made derogatory comments and yelled “This is MAGA country” - an apparent reference to Trump’s “Make America Great Again” campaign slogan. Chicago police Superintendent says that among the evidence investigators have that “Empire” actor Jussie Smollett staged the attack against him is a $3,500 check he allegedly paid two brothers to help him. Johnson said Thursday at a news conference that the brothers punched Smollett with gloves on during the Jan. 29 attack, but that investigators believe scratches and bruises on the actor’s face were likely self-inflicted. Police say the actor, who is black and gay, hired the two brothers, who are also black, to carry out the scheme. Johnson alleges that the reported attack was a “publicity stunt” that Smollett concocted because he was unhappy about his salary. Chicago Police Superintendent Eddie Johnson says “Empire” actor Jussie Smollett owes the city an apology. Smollett surrendered Thursday at central booking on a charge of felony disorderly conduct. Police say Smollett, who is black and gay, paid two brothers who are also black to help him stage a racist and homophobic attack against him on Jan. 29. Johnson says investigators think Smollett had hoped that the fake attack would be captured by one of the city’s many security cameras, but that didn’t happen. He says the camera at the location where the attack happened wasn’t pointed in that direction. Chicago investigators say they used public and private surveillance footage to track the movements of two brothers who they say “Empire” actor Jussie Smollett hired to stage an attack on him. Detective Commander Edward Wodnicki said at a news conference Thursday that investigators were able to see the brothers flee and get into a cab and use camera footage to follow the cab to another part of the city. He says more surveillance footage showed the brothers at O’Hare International Airport, where they boarded a flight to Nigeria. Investigators determined the brothers had a roundtrip ticket and detained them for questioning when they returned to Chicago on Feb. 13. Police allege that Smollett paid the brothers $3,500 to help him stage the attack. Smollett surrendered Thursday on a charge of felony disorderly conduct. The actor told police he was the victim of a racist and homophobic attack in downtown Chicago early on Jan. 29. The head of the Chicago Police Department says investigators know that “Empire” actor Jussie Smollett spoke to two brothers an hour before and an hour after he says they helped the actor stage last month’s attack. Johnson alleges that Smollett staged the attack because he was unhappy about his salary. 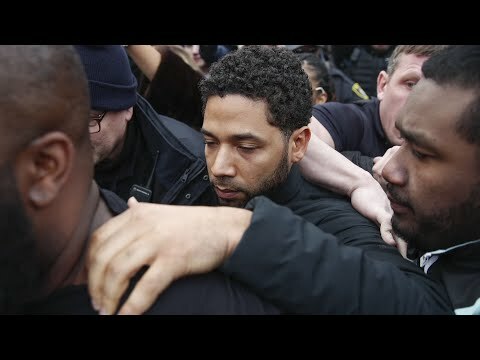 He says Smollett paid the brothers, who are black, $3,500 to help him. Police say the brothers participated for the money and are not considered suspects. Smollett surrendered Thursday at central booking on a charge of felony disorderly conduct. His lawyers say they will vigorously fight the charge. Authorities say the investigation into the attack on “Empire” actor Jussie Smollett took a new direction when the attorney for two brothers initially viewed as suspects suggested that police question them and that the men were “victims,” not offenders. Detective Commander Edward Wodnicki said at a news conference Thursday that after questioning the brothers for nearly two days last week, they were released and investigators no longer viewed them as suspects. Wodnicki says the brothers testified before a grand jury before prosecutors charged Smollett on Wednesday with felony disorderly conduct for allegedly filing a false police report. He turned himself in at central booking early Thursday. Smollett told police he was attacked by two masked men as he was walking home from a Subway sandwich shop at around 2 a.m on Jan. 29. The actor, who is black and gay, said they beat him, made racist and homophobic comments, poured some unknown chemical substance on him and looped a rope around his neck before fleeing. Johnson also said at a news conference Thursday that Smollett sent a racist and homophobic threatening letter to himself at the Fox studio lot before the attack. He says Smollett was dissatisfied with his salary. Smollett, who is accused of filing a false police report, was charged Wednesday with felony disorderly conduct. He turned himself in at central booking early Thursday. Police say the investigation shifted after they questioned two brothers who were in the area that morning. Chicago police say “Empire” actor Jussie Smollett has turned himself in to face a charge of making a false police report when he said he was attacked in downtown Chicago by two men who hurled racist and anti-gay slurs and looped a rope around his neck. Police spokesman Anthony Guglielmi tells The Associated Press that Smollett turned himself in early Thursday at central booking. Police Superintendent Eddie Johnson plans to hold a morning news conference and Smollett is expected to appear in court later in the day. The 36-year-old actor was charged Wednesday. The charge could bring up to three years in prison. It could also force the actor, who’s black and gay, to pay for the cost of the investigation into his report of a Jan. 29 beating. Less than a month ago, “Empire” actor Jussie Smollett was the seemingly sympathetic victim of a hate crime. Now he’s accused of a felony. The 36-year-old actor was charged Wednesday with making a false police report when he told authorities he was attacked last month in Chicago by two men who hurled racist, anti-gay slurs and looped a rope around his neck. The charge could bring up to three years in prison. It could also force the actor, who is black and gay, to pay for the cost of the investigation into his report of a Jan. 29 beating. A police spokesman says authorities are trying to negotiate Smollett’s surrender. Doubts about Smollett’s account started with reports that he had not fully cooperated with police. Check out the AP’s complete coverage of the Jussie Smollett case .